From Left to Right: Bob Silverstein, Enterprise Executive Sales Director, ACT; Dionne Henderson Director of Community & Multi-Cultural Initiatives at American Heart Association, American Stroke Association; Patricia C. Lane MBA, SCRN|Bon Secours Richmond Administrative Director Neurosciences, Bon Secours Richmond Health System; Dr. Stacey Epps, Executive Medical Director Bon Secours Virginia Neuroscience Institute. The American Heart Association/American Stroke Association recognizes American Stroke Month by focusing on efforts to teach family, friends and coworkers how to recognize the signs of stroke. 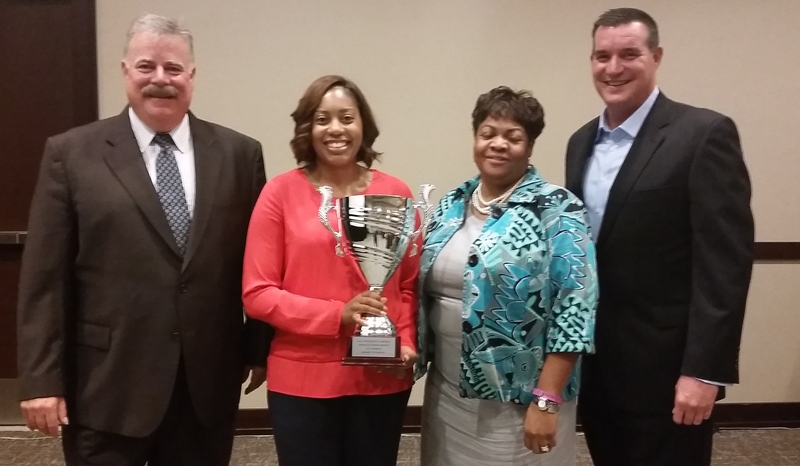 This year The American Heart Association awarded Bon Secours Richmond Health System the Best Integrated Campaign Award for 2015. The fourth largest and only faith-based health system in Virginia, Bon Secours Virginia provides full range of services to thousands of Virginians through a network of hospitals, primary and specialty care practices, ambulatory care sites and continuing care facilities across the Commonwealth. Bon Secours is accustomed to taking a leadership role in Neurological care, having established teleneurology initiatives more than five years ago with a goal to have all of its area hospitals joint commission certified. AcuteCare Telemedicine, the leading practice-based provider of Telemedicine services for hospitals seeking around-the-clock stroke and other urgent Neurological care is collaborating with Bon Secours Neuroscience Institute (BSNI), the neuroscience division at the not-for-profit Catholic health system sponsored by Bon Secours Ministries. 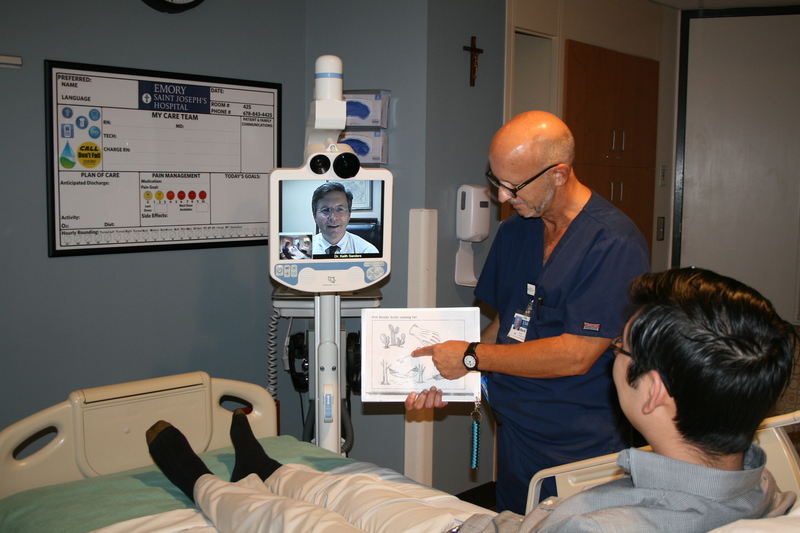 ATLANTA—Emory Saint Joseph’s Hospital is improving treatment for stroke patients with the launch of a Telestroke program, which allows neurologists to remotely evaluate patients around the clock through real-time conferencing with a Telerobot monitor. The faster a patient receives the proper treatment for stroke, the better the chances for recovery. With this new telemedicine program at Emory Saint Joseph’s, patients may avoid the debilitating effects of stroke that occur due to late diagnosis or delayed administration of clot-busting drugs. Along with Sanders, fellow AcuteCare Telemedicine physicians Matthews Gwynn, MD, Lisa Johnston, MD and James Kiely, MD are on-call 24/7 to work with the Primary Stroke Center Team at the hospital. During the evaluation, the physician asks the patients if they have had any difficulties with speaking and movement, and then encourages them to perform basic tasks, such as lifting their arms and legs and touching their fingers to their nose. “Time is brain,” says Regina Minter, RN, Quality Management Specialist for Emory Saint Joseph’s Primary Stroke Center team, stressing the importance of a rapid stroke diagnosis and treatment. “The Telestroke program will enable us to give tPA in a quicker amount of time for the benefit of our patients,” she says about the FDA-approved medicine that works by dissolving the clot and improving blood flow to the part of the brain being deprived. If administered within the first three hours, tPA may improve the chances of recovering from a stroke. Emory Saint Joseph’s treats more than 400 stroke patients a year, and joins Emory Johns Creek Hospital as the second hospital within Emory Healthcare to offer the Telestroke program. Since 2009, Emory Saint Joseph’s has been certified as a Primary Stroke Center, and is designed to provide emergent and acute stroke care. The multidisciplinary team includes ancillary, emergency and neurovascular services, a clinical decision unit, neurovascular units and a designated ICU. Emory Saint Joseph’s has been recognized on the “Target: Stroke Honor Roll” by the American Heart Association/American Stroke Association (AHA/ASA), meaning 50 percent of ischemic stroke patients arriving at the hospital received tPA (door-to-needle time) within 60 minutes of arriving. The AHA/ASA also recognized Emory Saint Joseph’s with the “Get with the Guidelines-Stroke” Gold Plus Quality Achievement Award for treating stroke patients with 85 percent or higher adherence to all “Get with the Guidelines-Stroke” achievement indicators for two or more consecutive 12-month periods. Since the inception of the Telestroke program at Emory Saint Joseph’s, patients have already benefitted from the rapid response of the neurologist, which takes an average of four minutes. “The first day we launched the Telestroke program, a patient was admitted with acute symptoms of stroke. After careful assessment, we were able to administer tPA immediately with great success,” Sanders says. Emory Saint Joseph’s Hospital was founded by the Sisters of Mercy in 1880, and is Atlanta’s longest serving hospital. The 410-bed acute-care hospital is recognized as one of the leading specialty-referral hospitals in the Southeast. As one of only three hospitals in the world to earn a fifth consecutive Magnet designation for nursing excellence from the American Nurses Credentialing Center, Emory Saint Joseph’s is also a leading provider of progressive and innovative medical care in a range of specialties from oncology and orthopedics to cardiology. Emory Saint Joseph’s Hospital is a member of Emory Healthcare, the largest, most comprehensive health system in Georgia. As telemedicine becomes a model for the delivery of healthcare, The Wall Street Journal recently published an article questioning if telemedicine could replace an ER visit. Read the full article included below as published in the Wall Street Journal on August 2, 2015 followed by Dr. Gwynn’s comments. When a Doctor Is Always a Phone Call Away Many of the 136 million ER visits in 2011 could have been replaced with a $50 telemedicine consultation. A 39-year-old truck driver was hauling through the Midwest in the middle of the night in 2011 when he began to feel a bit of indigestion. Then a lot of indigestion. He pulled over, recalling that his company had recently signed on with Teladoc, for which I was then the chief medical officer. The service allowed him to get a doctor on the phone within 15 minutes. He called and described his symptoms: nausea, chest pain, a little numbness in his left arm. He was having a heart attack, and his GPS guided him to the nearest emergency room. Getting that doctor on the phone saved his life, and potentially the lives of whoever his 10-ton rig might have plowed into had he keeled over behind the wheel. If efficient and affordable quality treatment is the goal, telemedicine should be the future of health care. When it comes to health care, “efficient” is a word that frightens people, calling to mind a soulless bureaucracy with an eye on the company’s bottom line. But it is inefficiency that is overburdening the medical system. Consider a woman with a urinary-tract infection who has to leave work to obtain a prescription from a doctor for a drug she already knows she needs. Or a man with a fever and hacking cough who has good health insurance, but who goes to the emergency room because his doctor’s office is closed. Americans are struggling to obtain affordable, convenient care, and 103 million people in the U.S. live in areas with a shortage of primary health-care providers, according to the Health Resources and Services Administration. Yet the country is dependent on expensive, brick-and-mortar facilities that require time-consuming travel. Primary-care doctors tend to cluster in urban areas. If you get sick in rural Wyoming, even during the workweek, your only choice might be the emergency room. In 2011, the Centers for Disease Control and Prevention reports, 136 million people were seen in an ER; many of those visits could have been replaced with a $50 telemedicine consultation. Researchers at the University of Rochester found that 28% of the visits at one pediatric emergency room involved ailments such as ear infections or sore throats that could be diagnosed over the phone. These problems are exacerbated by the increase in the elderly population, coupled with tens of millions of patients newly insured by the Affordable Care Act. A study in the Annals of Family Medicine projects that the U.S. will need 52,000 more primary-care doctors by 2025. Those positions aren’t filled easily. It takes 12 years and hundreds of thousands of public dollars to educate one primary-care doctor. But there is an untapped resource: the many doctors leaving their practices, fed up with the regulations and other hassles, but who love their patients, and the older physicians eyeing retirement because they no longer want to maintain an office. Why not let these doctors offer their expertise to patients by smartphone? Doctors who contract with a telemedicine company can opt for a specific block of time when they are “on call” to patients, picking up the phone and answering questions in 10- to 15-minute intervals. The doctor is paid and the patient gets a prompt and inexpensive answer to a concern. Home care of individuals with major chronic conditions would also substantially benefit from telemedicine. Millions of houses have cable and satellite connections that can be used to monitor patients wearing wireless devices, allowing health professionals to intercede at the first sign of trouble. This can reduce rates of hospitalization by half or more, some studies suggest. While there is worry about the quality of these interactions, telemedicine companies assess their doctors routinely and maintain strong quality-assurance programs. Every doctor is taught in medical school that 80% of diagnoses are obtained through a medical history and symptoms, and not by what a doctor sees, touches or tests. Telemedicine will never completely supplant face-to-face visits, and most doctors naturally would prefer to treat a patient in person. The American Medical Association, for instance, has encouraged restriction of telemedicine to patients who have an established relationship with a doctor, and some state medical boards try to enforce that view. But the perfect cannot be the enemy of the good—and by continuing to practice medicine as usual, we are making it so. Millions of Americans live in areas that are short of primary-care doctors, and millions more go to the emergency room when they have a sore throat. Entrepreneurs have responded by creating methods of connecting patients to doctors remotely, which reduces costs and satisfies patients. There is no scenario for sustaining or improving health care in America without telemedicine. State and federal governments, as well as the medical establishment, should embrace the technology. For one thing, they should change Medicare and Medicaid to allow reimbursement for telemedicine consultations, most of which are currently not covered. Ask that truck driver if he thinks talking to a doctor over the phone has value: He is still alive and trucking. Dr. Boxer is the chief telehealth officer of Pager and chief medical officer of Well Via. An earlier version of this article misstated the name of the journal that published a study of the need for 52,000 more primary-care doctors by 2025. It is the Annals of Family Medicine. Telemedicine is a critical part of the new healthcare delivery model. As healthcare organizations begin adopting new practices, the conversation around proper use, application, and the effect on patient outcomes will continue.